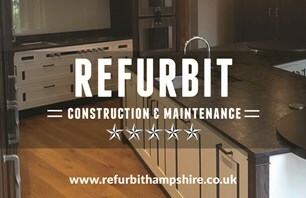 Refurbit Hampshire - Bathrooms, Builder, Carpenter, Kitchens based in Winchester, Hampshire. We are the next generation of traditionally skilled tradesmen. New concepts to suit all. Whether you require a x2 hour Maintenance session or a full home makeover, we will always be happy to help and advise. References on request full public liability for any additional information or an estimate please get in touch. Winchester , Southampton, Bournemouth. Hampshire the surrounding counties.